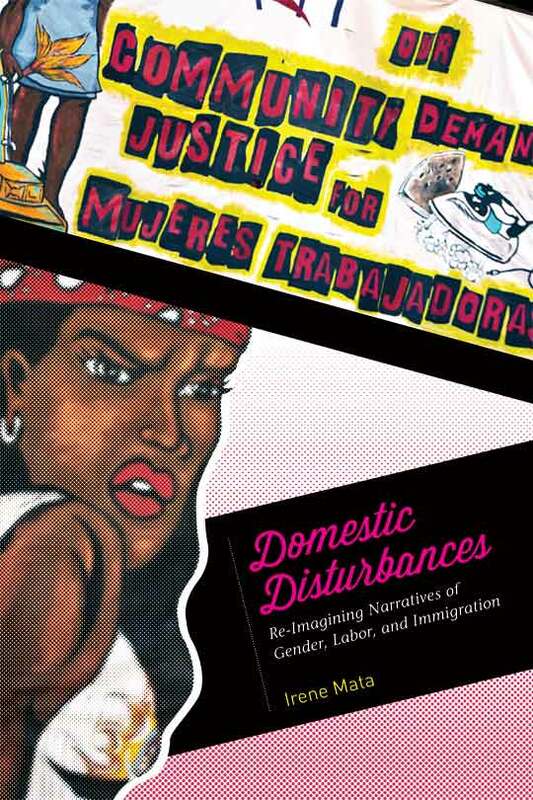 Domestic Disturbances examines the treatment of the traditional immigrant narrative in popular culture, illuminating the possibilities of alternative stories by reading Chicana/Latina-produced texts through a new interpretation of the immigrant paradigm. The issue of immigration is one of the most hotly debated topics in the national arena, with everyone from right-wing pundits like Sarah Palin to alternative rockers like Zack de la Rocha offering their opinion. The traditional immigrant narrative that gained popularity in the nineteenth and twentieth centuries continues to be used today in describing the process of the “Americanization” of immigrants. Yet rather than acting as an accurate representation of immigrant experiences, this common narrative of the “American Dream” attempts to ideologically contain those experiences within a story line that promotes the idea of achieving success through hard work and perseverance. In Domestic Disturbances , Irene Mata dispels the myth of the “shining city on the hill” and reveals the central truth of hidden exploitation that underlies the great majority of Chicana/Latina immigrant stories. Influenced by the works of Latina cultural producers and the growing interdisciplinary field of scholarship on gender, immigration, and labor, Domestic Disturbances suggests a new framework for looking at these immigrant and migrant stories, not as a continuation of a literary tradition, but instead as a specific Latina genealogy of immigrant narratives that more closely engage with the contemporary conditions of immigration. Through examination of multiple genres including film, theatre, and art, as well as current civil rights movements such as the mobilization around the DREAM Act, Mata illustrates the prevalence of the immigrant narrative in popular culture and the oppositional possibilities of alternative stories. IRENE MATA is Associate Professor in the Women’s and Gender Studies Department at Wellesley College in Wellesley, Massachusetts, where she teaches courses in Chicana/Latina literature and culture. In Lin-Manuel Miranda’s 2008 Tony Award–winning musical In the Heights , the character Abuela Claudia asks the question, “What do you do when your dreams come true?” as she reveals to the audience that she has won the lottery. While the dream of winning the lottery is one shared by many, Abuela Claudia’s song “Paciencia y Fe” is not a simple expression of celebration. Instead, Miranda uses the song to give us Abuela Claudia’s story of immigration and labor. We learn that she and her mother left the warmth and familiarity of La Vibora in Havana, Cuba, many years before for a cold and dreary life in the United States, a decision based on economic necessity. In her emotional musical narrative, Abuela Claudia recalls the difficulties of living in New York City, including finding housing, searching for work, and learning to speak English. Abuela Claudia’s moving song becomes her immigrant narrative, explaining to the audience the reason for migration and the struggles she and her mother encountered in their transition. While the phrase “paciencia y fe” (patience and faith) is repeated throughout the composition, the song is very much about the frustration of having one’s dreams deferred. Abuela Claudia’s family’s life was one of work and hardship, and the only inheritance left behind for her was the combination of her memories and her mother’s dreams. The song ends with mention of a decision the audience doesn’t learn about until Abuela Claudia’s duet with Usnavi, the protagonist of the play and the young man she helped raise as her own grandchild. In the song “Hundreds of Stories,” she makes plans with Usnavi to divide the winnings in three in order to share with Usnavi and his cousin Sonny. She wants to return to the Caribbean and enthusiastically sings of the “seaside air” and of opening with Usnavi a beachside bar, a place where they will make new memories. Even though they are at least a generation apart and Usnavi’s family is from the Dominican Republic, not Cuba, they share a lifetime of work and the memories and dreams of parents long gone. At the center of these is the notion of “home,” and it is this notion that lies at the heart of their own dreams of creating new stories in a place far removed from their difficult life in Washington Heights. For Abuela Claudia, home continues to exist in a place where “the sea meets the sky,” an island where she and Usnavi will create their own stories of home. Abuela Claudia’s story in Miranda’s production gives us a glimpse into the complicated narrative of immigration shared by many. While her story includes the hardships faced by those who immigrate to the United States, her chronicle is important because of what is conspicuously absent from her narrative: an impetus for immigration based on the “American Dream.” Instead of seeing a representation of the decision to leave Cuba as a quest for success in the “land of opportunity,” the audience gets a clear understanding of the need for economic survival that forced Abuela Claudia and her mother to leave their home. Of even more significance is the fact that Abuela Claudia’s dream is to return to a “home” that lies outside of the space she has inhabited for the majority of her life. Even though Washington Heights has been the location in which she resides, it and the United States are not the spaces she considers home. The dream of winning the lottery holds for her the promise of creating her own stories in a place she sees herself as truly belonging. Abuela Claudia’s immigrant narrative does not fit comfortably into the rhetoric of assimilation and upward mobility at the center of the ideology of achieving the American Dream. Instead, her story offers an audience a version of immigration and notions of home that complicate the conventions of a popular genre and raise questions about the complexity of immigration narratives in our current historical moment. The type of immigrant narrative that has enjoyed favor for more than a century has traditionally been that that promotes an image of the United States as a nation of immigrants, where hard work and perseverance will translate to individual success. At the heart of this literary tradition is the desire to be embraced by one’s adopted country and an emphasis on creating a better home for oneself within the borders of the “land of opportunity.” Unfortunately, such an idealized narrative has been out of the realm of reality for multiple immigrant groups, whose “difference”—be it racial, religious, cultural, or class based.-cannot be easily subsumed under the rhetoric of “American.” Through a representation of alienation and class struggle, Miranda’s character Abuela Claudia illustrates the limitations of the traditional immigrant narrative and offers an alternative version, one rooted in hardship and disappointment. The aspiration in her narrative is not for the achievement of the American Dream, but for the creation of a space where she will finally feel at home, a space that does not exist within the constructed—physical or ideological—boundaries of the nation. The issue of immigration is one of the most visible and contentious topics of debate in the national arena, with everyone from right-wing pundits like Sarah Palin to alternative rockers like Zack de la Rocha offering their opinions. While immigration reform took a backseat during President George W. Bush’s terms because of the events of September 11, 2001, and the subsequent war, the debate around immigration once again entered the national spotlight after he left office. With the country in a recession, it comes as no surprise that the practice of scapegoating immigrant workers is once again popular. What is new is the extent to which misinformation and opinion are being disseminated through multiple electronic venues such as internet blogs and social-networking sites. Along with more traditional forms of media, new media platforms have invited their audiences to participate in the debate. The ease with which it is now possible to share news stories, blogs, and articles has allowed for a broad circulation of views on immigration reform. Similar to the use of vitriolic rhetoric against Mexicans/Mexican Americans (both citizens and noncitizens) during the Great Depression, we are witnessing a resurgence in anti-immigrant sentiment and policies on a much wider scale. The clash of pro-and anti-immigrant groups over Arizona’s 2010 Support Our Law Enforcement and Safe Neighborhoods Act (SB 1070) is illustrative of the larger debate around immigration, labor, and citizenship. The law makes “the failure to carry immigration documents a crime and give(s) the police broad power to detain anyone suspected of being in the country illegally” (Archibold). Opponents of the law consider it a legalized form of racial profiling and worry about the effect of such a discriminatory piece of legislation on the Latino community. While the legislation is currently being challenged on multiple grounds by the Justice Department and by coalitions like the one formed between the Mexican American Legal Defense and Education Fund, the American Civil Liberties Union, and the National Immigration Law Center, the anti-immigrant sentiments of the law have moved beyond the boundaries of Arizona. The multimedia political news source Politico analyzed the 2010 gubernatorial races and found that “of the 37 gubernatorial races this year, candidates in more than 20 states have endorsed adopting a strict Arizona-style immigration law or passing legislation that makes it harder for illegal immigrants to live, work and access basic public benefits in their state,” and states like Georgia have passed laws based on SB 1070 (Budoff Brown). The emergence of such draconian policies is disturbing, but, as evidenced by a history of exclusionary immigration policies, not new. Even before the passage of SB 1070, the state of Arizona had found itself in the middle of the immigration discussion when the decision was made to construct a nearly 2,000-mile-long wall between the United States and Mexico to stop the influx of undocumented immigrants into the country. One month before the passage of the Secure Fence Act, signed into law by President Bush in October 2006, the Arizona Daily Star in Tucson sent an investigative team along the nearly 2,000-mile U.S.–Mexico border in an attempt to provide its readers with an understanding of the issues surrounding the immigration debate. The Star’s four-part series, entitled “Sealing Our Border: Why It Won’t Work,” follows a group of journalists in their journey from San Diego to the Gulf of Mexico in a report that looks at the economic, cultural, and physical geography of the border. One of the most intriguing parts of the series, “The Legacy of Gatekeeper and Hold the Line,” investigates the role that the construction of physical barriers has played in keeping out undocumented immigrants. Through various interviews, the report represents diverse views regarding the militarization of the border and provides a comprehensive look at the conflicting sides of the debate. Of particular interest is an interview with Border Patrol Agent Christopher Bauder, who is identified as having patrolled the San Diego Sector for over nine years. Bauder believes that Operation Gatekeeper has been unsuccessful and that closing off the border will ultimately fail because the real issue in the immigration debate is employment, not border security. Based on his observations, Bauder claims that “ninety-five percent of the people that cross the border are coming to find work.” Bauder’s statement emphasizes the economic relationship that exists between immigration and labor. For Bauder, the resolution to the immigration problem lies in going after businesses that hire undocumented workers. Even though Bauder and those like him who argue for a crackdown on employers understand the relationship that exists between labor and immigration, the discourse he utilizes is contained within a rhetoric of immigration that emphasizes its effects on the nation and the importance of maintaining nation-state boundaries. While there are multiple positions on the immigration debate, one thing that most vocal proponents and opponents of immigration have in common is the emphasis they place on the domestic consequences of the growing number of immigrants. Scholars like Vernon Briggs and conservative political right-leaning groups like Numbers USA and the Center for Immigration Studies claim that undocumented immigration adversely impacts the United States because immigrants take away jobs from “real Americans” and place undue strain on government resources. Briggs contends, in particular, that undocumented workers hurt the African American working class by competing for its jobs and, in the process, suppressing wages. Some opponents of immigration rely on the racist rhetoric that situates immigrants as too different (read “inferior”) from white Americans and see the growing number of immigrants as a threat to the culture of the nation—a culture they see as based on the mythology of a homogeneous white citizenry. On the other hand, pro-immigrant organizations like the Cato Institute and the Pew Research Center’s Hispanic Trends Project maintain that immigrant workers are a necessary part of the national economy and contribute to the well-being of the nation through their labor and the taxes they pay. These organizations tend to see immigrants as adding to the cultural diversity of the country, a diversity based on liberal ideas of multiculturalism (which run the danger of glossing over important differences). Both sides of the argument concentrate their debates on the effects that immigrants have on the country, but they situate immigration within the boundaries of labor and the nation, in isolation from the geopolitical realities that influence immigration patterns. In explaining why people “choose” to immigrate to the United States, many employ the rhetoric of the United States as the land of opportunity, a place where dreams can come true. This rhetoric, however, makes the assumption that the American Dream is a possibility for all and obscures the changes that have occurred under a new global regime of interconnected economic and political networks. My interest in the current immigration debate lies in understanding how cultural productions engage in the discussion of immigration and participate in the circulation of ideologies regarding immigration and labor—specifically through their depiction of immigrant women workers. One of the most effective ways of reading these representations is through a study that deconstructs the conventional immigrant story, an anachronistic narrative that continues to be perpetuated both in cultural productions and in the general debate about immigration. The traditional immigrant narrative, a genre in American literature that became popular during the late nineteenth and early twentieth centuries, continues to be used today in describing the process of the “Americanization” of immigrants. The tale is ultimately a narrative of progress, acting as an ideological tool that attempts to contain the experience of immigrants within a story line that promotes the idea of achieving success, i.e., the American Dream, through hard work and perseverance. Often left out of such a conventional narrative are stories of structural racism, sexism, and classism, obstacles that many immigrants find insurmountable, regardless of how hard they work. As a tool of analysis, the traditional narrative of immigration is no longer a useful framework for tracing the ventures of modern immigrants, nor for determining the differences that exist among immigrant populations. Instead, the schema becomes useful in a project of deconstruction and creation of alternative narratives. In fact, new narratives are challenging these “success stories” and act as a stepping-stone to new schemas of narration that more accurately engage the realities of contemporary immigrant experiences. The purpose of my project is twofold: to read the conventional immigrant narrative as a type of ideological system of containment whose organizing logic can be challenged and ultimately dismantled; and to identify the creation of a Latina genealogy of immigrant literatures that provides oppositional narratives that offer decentralized accounts of power and exploitation. The majority of scholarship on the immigrant-narrative genre has tended to look at canonical texts like those of Mary Antin, William Carlos Williams, and Anzia Yezierska and has been limited to written works. While the analysis of these texts has been instrumental in understanding the immigration histories of some European immigrants and in identifying the conventions of the genre, it has tended to overlook the differences between a European immigration experience and those of non-European immigrants. For example, literary critic William Q. Boelhower, in his essay “The Immigrant Novel as Genre,” identifies the macroproposition of the immigrant novel thus: “An immigrant protagonist(s), representing an ethnic world view, comes to America with great expectations, and through a series of trials, is led to reconsider them in terms of his final status” (5). In her/his journey toward achieving the “final status,” the protagonist must reconcile the tension between the old world and the new. That reconciliation can take the shape of various outcomes, ranging in degree from attempting to hold onto old-world culture in the new world, to completely assimilating into the new world, leaving the old world behind. Boelhower also identifies the schema of the narrative in the protagonist’s quest for reconciliation. The narrative, written in the traditional linear structure, follows the protagonist through three stages, or phases: expectations, contact, and resolution. The immigrant’s story usually begins in the phase of expectations, which can occur in the old world or the new world and is the moment of the immigrant’s dream, the moment of imagining the possible new world. It is in this stage that the immigrant protagonist is often the most invested in the ideology of the United States as “America,” the land of endless opportunity. Following the stage of expectations is that of contact, where the protagonist faces various experiences and trials in the new world. These trials often take the form of economic struggle, hard labor, and discrimination based on being a new arrival. The challenges survived during the contact phase ultimately lead to the final phase, resolution, where the protagonist either achieves assimilation or becomes alienated, and, according to Boelhower, it is this alienation that “leads the protagonist to idealize the old world—either through an attempt to preserve his old world culture, even though he may be assimilated into the new world, or through a stiff criticism of an alienating set of experiences in America”. To understand the organizational logic behind the structure, we must begin with an understanding of the historically popular immigrant story. Getting to the heart of this literary tradition allows those invested in challenging cultural systems of power the opportunity to contest the logic through a project of deconstruction. The conventional structure of the immigrant narrative functions as an ideological tool that masks struggle and oppression to keep intact the myth of the nation as the “city on a hill.” The schema identified by Boelhower functions as a form of “systematizing thought,” to use Michel Foucault’s terminology, and as such can be analyzed and dismantled. When we insert subjugated histories and contest the structure of the schema of this master narrative, the fissures in the conventional narrative widen into much larger ruptures that cannot be easily subsumed under the narrative’s organizing logic. Through these cracks come forth narratives of immigration that question our assumptions about the processes of diasporic movement and our national construction of citizenship and belonging. The centering of these often-marginalized stories allows cultural producers to create oppositional narratives that challenge the ideological containment of the traditional schema. The notion that if one just works hard enough, one will be successful is a powerful aspect of the dream. Inherent in this ideology is the idea of meritocracy, the belief that what one gets out of the system is relational to what one puts into it. A person is successful based on individual merit, “generally viewed as a combination of factors including innate abilities, working hard, having the right attitude, and having high moral character and integrity” (McNamee and Miller). Under a system of meritocracy, a nation’s resources are allocated and distributed based on the merit of individuals. If a person is unable to achieve economic success, it is seen as a failure of the individual, a lack either of drive or of ability or a deficiency of character. Absent from this construction are forces that impede one from succeeding based on individual merit. The simplistic structure of meritocracy does not account for important “social gravity” factors—including inheritance, access to education, and discrimination—that keep an individual within a specific class location regardless of merit. To understand the function of the American Dream ideology as part of a larger construction of the nation, we need to identify it for what it is: a myth. While the word “myth” is used to describe everything from creation stories to religion, I want to employ a definition of it based on Roland Barthes’ understanding of it as a system of communication, a “form” ( Mythologies 109). For Barthes, myth is a message, an ideology, and as such, can be read and deconstructed. Barthes points out that the power of myth lies in its ability to naturalize, to “transform history into nature” ( Mythologies 129). If we employ Barthes’ practice of reading myth as a system of meaning, we can begin to read the American Dream as a powerful ideological tool that lies at the center of the traditional immigrant narrative. We can recognize how this idea of success obfuscates the role played by structures of power in creating opportunity and privilege. By looking at the American Dream as a constructed ideology, a myth, we can begin to deconstruct the traditional immigrant narrative and investigate how the narrative itself is a myth, a set of ideologies about the nation and belonging. Deconstruction of the myth of the American Dream is dependent on inserting invisible histories and uncovering marginalized narratives. In his discussion of genealogy, the local, and the return of knowledge, Michel Foucault outlines his notion of “subjugated knowledges.” For Foucault, it is the emergence of subjugated knowledges, the “historical contents that have been buried or masked in functional coherences or formal systematizations,” along with “a whole set of knowledges that have been disqualified as inadequate to their task or insufficiently elaborated: naive knowledges, located low down on the hierarchy, beneath the required level of cognition or scientificity,” that can lead to a discursive critique of organized systems of power (7). The combination of alternative scholarly knowledge (which has been omitted from traditional histories) and marginalized local knowledge (which has been disqualified and dismissed as inferior) disrupts the systemic ordering and separation of knowledge and knowledge production. The conventional immigrant narrative operates based on a dependence on an ideologically constructed history—a history that privileges a specific construction of the nation as a democratic and meritocratic state. Left out of this official history are the stories of struggle and oppression of those groups that remain in the periphery. In employing both of these types of subjugated knowledges to critique official discourses, the possibility of disrupting structures of power becomes a new reality. If we analyze the conventional immigrant narrative from a position in the margins, from a position that questions the myth of upward mobility and assimilation, the power of the narrative is undermined. Once we read the traditional immigrant story as a myth, we can begin to recognize the possibilities of using the narrative to undermine conventional ideologies. In her discussion of the “ Methodology of the Oppressed ,” Sandoval maps out the five strategies that have aided the survival of marginalized groups under various systems of oppression: “the technologies of semiotics, deconstruction, meta-ideologizing, democratics and differential movement” (146). Using the technology of semiotics, or the reading of signs, to deconstruct signs is a two-pronged strategy of resistance. Meta-ideologizing challenges dominant cultural forms through the appropriation of existing ideologies, or what Sandoval terms the “ideologization of ideology itself” (108). The technology of democratics brings together existing techniques for the purpose of egalitarian social change. The fifth technology, differential movement, allows for the operation, maneuvering, and progression of the other four technologies that make up the Methodology of the Oppressed . These techniques, or “oppositional technologies of power,” allow for a decentering of power that makes possible the movement toward recognizing the oppositional possibilities that exist in alternative narratives of immigration. By reading new narratives as examples of a “ Methodology of the Oppressed ,” we read in them alternative histories and narratives of immigration that challenge the ideological enclosure of the traditional immigrant schema. Integral to a discussion of the immigrant narrative is the emphasis it places on assimilation. In the traditional narrative, the goal of assimilating into the dominant American society is an important marker of success and, as evidenced by Samuel Huntington’s sentiments above, proof of national belonging. While an assimilationist narrative provides an uncomplicated ending that gestures toward a happily-ever-after conclusion, theories of assimilation and acculturation are anything but simple. Herbert J. Gans’ distinction between the two terms, one he argues was part of the conventional usage in the 1940s at the University of Chicago, is “based on the difference between culture and society and, accordingly, acculturation refers mainly to the newcomers’ adoption of the culture . . . of the host society . . . assimilation . . . refers to the newcomers’ move out of formal and informal ethnic associations . . . into the nonethnic equivalents accessible to them in that same host society” (877). In other words, “acculturation” means adopting certain aspects of the host country’s culture that the immigrant views as favorable or useful while retaining the immigrant’s connection to his or her own culture. “Assimilation,” however, implies a rejection of one’s culture to be absorbed into the larger, hegemonic mainstream. While assimilation has enjoyed certain moments of popularity, many now view it as a negative process and prefer a more acculturationist model. In their defense of assimilation theory, Richard Alba and Victor Nee provide a review of canonical accounts of assimilation and trace the popular theories surrounding the subject. From discussion of earlier conceptions of assimilation, like Milton Gordon’s “structural” assimilation and W. Lloyd Warner and Leo Srole’s “straight-line” assimilation, to more recent conceptions, like socioeconomic assimilation and residential/spatial assimilation, Alba and Nee’s essay highlights the complexity of the construction and the changes that the field of study has undergone. For Gans, the polarization between acculturation and assimilation is unnecessary since he believes that the labels have been misleading and that “so-called assimilationists have actually been emphasizing acculturation (becoming American culturally but not necessarily socially)” (876). He introduces the term “ethnic retentionists” to refer to individuals “who avoid acculturation and instead retain their ethnic ties” (876). Gans, however, also rejects positioning acculturation and ethnic retention as necessarily polar and instead argues for a reconciliation of the two positions based on his argument that “even when second and third generation ethnics may have become almost entirely acculturated, they still retain a significant number of ethnic ties . . . and cannot be said to have assimilated . . . This is not at odds with ethnic retention theory, which mainly argues that ethnic social ties are being retained, but which pays less attention to ethnic cultural retention. Thus, the two positions differ less in empirical reality than in debate” (876). Gans’ distinction is important as it points to the gap that can exist between empirical research on a subject and the discussion that takes place around it. In this project, I rely on the more traditional conception of assimilation because of the popularity it continues to enjoy in our national discourse on immigration. The acceptance of Huntington’s thesis on the inability or unwillingness of Mexican immigrants to assimilate illustrates the continued dependence on a simplistic assimilation/non-assimilation binary. For the most part, cultural producers are not interested in the complexities of assimilation/acculturation, but instead continue to flatten the topic to provide simple and easily consumed plotlines. Just as the dominant rhetoric of the immigration debate fails to fully encompass the complexities of the current immigration and labor situations, the traditional immigrant narrative is unsuccessful in representing the changing immigration experience. The schema that Boelhower identifies is based on an ethnic model of difference that functions well in analyzing the more traditional white immigrant stories, but doesn’t meet the needs of immigrant stories of people of color who cannot simply assimilate because of the issue of race or who do not see assimilation as something to be desired. The traditional schema’s inability to easily translate to narratives of people of color also illustrates the limitations of the conventional immigrant paradigm in describing more recent immigration patterns and experiences. Despite the real differences in immigration patterns and experiences, popular cultural productions continue to use the dominant immigrant narrative as a basis for the representation of the immigration of people of color; revisions of this narrative, on the other hand, are being undertaken by authors who are challenging its story line. As Lisa Lowe has argued, “Cultural productions emerging out of the contradictions of immigrant marginality . . . intervene in the narrative of national development that would illegitimately locate the ‘immigrant’ before history or exempt the ‘immigrant’ from history” ( Immigrant Acts 9). Cultural productions about marginalized immigrant communities whose immigrant experiences are not necessarily stories of progress serve to disarticulate the dominant immigrant narrative and ensure the visibility of different immigrant patterns that have influenced the formation of the United States as a heterogeneous nation. The conventional paradigm of the immigrant story is based on a clear geographical and ideological distinction between the old world and the new world, a differentiation that positions the United States as the preferred location. The new world is supposed to represent modernity, while the old world stands for antiquated ideas that must be rejected in order for the immigrant subject to transition into a subject of modernity. In revising the dominant narrative of immigration to include the different realities of immigrants of color, a new immigrant story should not only challenge the conception that one must reject the old world in favor of life in the new world, but ultimately reject the constructed distinction between the old world and the new world. The emphasis on creating new immigrant stories that more closely illustrate the lasting relationship that exists, not between old world and new world, but between countries of origin and host countries, and between new and earlier immigrants, allows the narratives to go beyond being just individual stories. The story of Abuela Claudia is just one of many immigrant narratives that portray the connection that remains between immigrants’ adopted country and the home they have left behind. These new narratives become cultural productions that demand a new way of representing immigration, a representation that rejects the old/new world binary in favor of a model that reframes the experience in terms of immigration relationships that exist within a connected global network. In such a representation, the links that exist between the country of origin and the host country become more clearly evident and immigration is seen as a condition that is not necessarily precipitated by the desire to achieve the American Dream, or one that ends with arrival in the United States. Abuela Claudia’s story and her dream of returning to the Caribbean, the place she still considers home, make a strong argument for a more complex narrative structure and displace the United States as the preferred site in which to create one’s home. The relationship between the country of origin and the host country can be much more easily understood if conceptualized as fitting into what scholars such as Immanuel Wallerstein refer to as a world-system. Within a world-systems analysis, the theory of modernization—one that is predicated on the constructed spatial/temporal differences between nation.states—is rejected in favor of studying countries within an interconnected global system. The world-systems analysis rejects the binary between modern and premodern/less modern and the hierarchy that such a binary makes implicit. Instead, Wallerstein argues for an understanding of the current capitalist global system as being predicated on the extensive division of labor that occurs between what he refers to as the core states and the peripheral areas. The core states exploit the peripheral areas through a range of methods, including the exporting of peripheral areas’ natural resources and raw materials and the importing of manufacturing industries to employ cheap labor. By referring to economically dominant countries as the “core,” Wallerstein is underscoring the imbalance of power that exists between the core and the periphery, while emphasizing the interconnectedness of the two areas. When the new immigrant narrative is situated as occurring under a world-system, the movement of people across constructed national boundaries is no longer described as occurring between spatially and temporally differentiated areas, but instead as taking place within a global system that is based on various economic and political relationships. The acknowledgment of the relationship between the immigrant and the two countries s/he inhabits becomes an important tool in understanding the changes that have taken place in the immigration patterns of the United States. In her work on immigration and globalization, Saskia Sassen stresses the importance of understanding immigration beyond domestic policies and the internal effects of the movements of diasporic peoples. Sassen argues that while conditions of poverty, unemployment, and overpopulation do play a role in migration, they alone do not promote the large-scale emigration we are currently seeing, and it is important to understand the processes that transform these conditions into a “migration inducing situation” ( Mobility 6). A focus on the more commonly acknowledged conditions of migration ignores the internationalization of production and migration in favor of an analysis that focuses on the domestic—making immigration a domestic problem for the host (receiving) country and isolating the process from the more global relationship between the sending and receiving countries, or the periphery and the core. In her analysis of the Dominican Republic, Haiti, and Mexico, Sassen argues that these countries “accentuate, first, the fact that U.S. business, military, or diplomatic activities were a strong presence in countries that have significant migration to the U.S.” and that “secondly, it is important to emphasize that the combination of poverty, unemployment, or underemployment with the emergence of objective and ideological linkages probably operates as a migration inducing factor” ( Mobility 9). The massive increase in migration to the United States can only be accurately studied if the connections—be they military, economic, or ideological—between sending countries and U.S. foreign policy are fully understood. Along with economic restructuring, U.S. military intervention in Latin America and the Caribbean has also created a mass displacement of people that has affected immigration. The creation of “new enclosures” in the current world-system serves to further illustrate the correlation that exists between the core and the periphery. The ideological containment performed by the conventional immigrant paradigm and the national debate on immigration functions to downplay or erase the initial reason for immigration and disregards the connection between the core and the periphery. Both the debate and the conventions of the genre place an emphasis on the economic opportunities (i.e., the American Dream) and the democratic, meritocratic system the United States offers immigrants (i.e., the “city on a hill”), but they ignore the reality of the role that U.S. foreign policy, alone and in conjunction with the International Monetary Fund and the World Bank, has played in restructuring countries of origin. Ultimately, the United States itself should be held accountable for the migration into the country. The resolution at the end of the traditional immigrant narrative and the national debate on immigration both assume that a level of assimilation is the ultimate goal that is eventually to be achieved. Proponents and opponents of immigration both take for granted that an immigrant’s life will automatically be more successful in the United States. Again, the reality of immigrants of color, both documented and undocumented, resists such an easy resolution. Boelhower’s narrative schema is insufficient in describing the experience of immigration under our present world-system. It is a very general schema that does not consider the very complicated relationships the immigrant subject must navigate before, during, and after emigration. Within such a schema, important issues that make up the current immigrant experience—such as an immigrant’s un/documented status, or a sending community’s dependence on remittances (money sent home by workers who have emigrated), or the militarization of constructed national boundaries—are completely absent. Even though some contemporary critics have attempted to insert narratives of immigration by people of color into the U.S. literary canon, they do not directly challenge many of the assumptions present in the traditional immigrant narrative schema. In contemporary cultural productions, new oppositional narratives are central in understanding and capturing the experience of immigrant workers. Instead of providing a linear narrative of progression of immigration, I argue that certain contemporary immigrant narratives of people of color provide us with a representation of immigration as a set of continuous conditions that do not end or begin with the physical arrival of the immigrant into the new country. Like theories of modernization, the older schema of narration is based on a continuum of progress and temporal movement. A country is said to go from premodern to modern, just as the protagonist of the traditional narrative goes from the phase of expectations to a final resolution, or from being a subject of the periphery to the possibility of becoming a citizen of the core. The linear movement in the story is easily mapped out through the narrative. Unlike the line of progression in these narratives of progress, oppositional narratives resist being diagrammed on a steady upward slant, but instead call for an illustration of the various conditions that immigrant subjects encounter. There is no simple beginning or ending. Instead, these stories represent the negotiating of relationships and experiences, including the impetus for emigration, the journey and crossing of the border, and the relationship of the immigrant subject to family, community, and labor. These continuous relations can exist simultaneously and are not necessarily experienced chronologically or in different spaces; in other words, they take place in the core and in the periphery. There is no unequivocal temporal or ideological separation between the host country and the country of origin. By insisting on an understanding of the movement of peoples across constructed boundaries, as occurring under a world-system of connections, the revised narratives challenge the ideological closure of the narrative of progress and immigration being redeployed by popular representations of immigration and the current debate on immigration reform. I want to further emphasize the role that work and the struggle for survival play in becoming an immigrant subject by reading the alternative narratives through the lens of labor. In paying specific attention to gender, through an analysis of texts dealing explicitly with female immigrant protagonists and characters, I also want to place new immigrant narratives within the changing gender composition of emigration under globalization. By employing a reading of texts through a contemporary immigrant narrative of labor, while also using, to borrow Henry Louis Gates Jr.’s term, a “culture-specific methodology” that places at its center race, gender, and class, I find that a much more historically situated analysis of immigration and labor becomes possible. In his discussion of subjugated knowledges, Foucault argues that genealogy plays a pivotal role in the excavation of buried histories and obscured local knowledges. For Foucault, the role of the genealogist is not to ignore historical sequences or to reject knowledge, or to replace this organizing system with our own, but instead to recognize the “tyranny of overall discourses” (8). Genealogies are about “insurrection of knowledges . . . against the centralizing power-effects that are bound up with the institutionalization and workings of any scientific discourse organized in a society such as ours” (9). In this project, I position Latina cultural producers as an example of genealogists who incorporate marginalized histories to challenge the construction of the nation as an egalitarian meritocracy that offers all immigrants the opportunity to achieve the American Dream. Through their centering of histories of oppression and injustice, Latina genealogists provide new narratives of immigration that put forth decentralized accounts of power and exploitation. The accounts incorporate local and marginalized knowledges for critical inquiry and encourage audiences to question assumptions about labor, migration, and gender. By approaching texts offered by producers of nontraditional cultural productions, we can uncover the oppositional possibilities their narratives present. While expanding the parameters of the genre, the alternative texts challenge problematic and potentially dangerous representations of immigrant bodies and complicate the simplistic rhetoric that surrounds our current immigration debate. The work of such writers and artists humanizes individuals who are often rendered just numbers by popular media, pundits, and politicians. These narratives, I argue, now constitute a Latina genealogy of immigrant literature and provide a powerful body of counternarratives that confront the ideological project of the conventional immigrant narrative, while inserting into the nation’s awareness immigrant bodies most often rendered invisible and undesirable. One of the first critical representations of the physical crossing of the U.S.–Mexico border is found in Gregory Nava’s 1980 film El Norte . In the critically acclaimed film, Nava provides a horrific visual representation of economic and military enclosures that prompt the migration of brother and sister Enrique and Rosa Xuncax from Guatemala. The Guatemalan army, to protect the interests of coffee growers, terrorizes any worker who attempts to organize or to resist extreme labor exploitation, and the Xuncax siblings must flee their home country to avoid being executed. While not all contemporary immigrant stories so clearly illustrate the reasons for emigration, an important aspect of oppositional narratives is their representation of the conditions under globalization that act as the impetus for emigration. Many of the narratives mention the inability to earn a living in the country of origin, due to the lack of work or the substandard wages that make survival virtually impossible. Some place emphasis on emigration taking place to avoid violence, while others represent the reasons for it as various displacements. The conditions behind the diasporic movement of the immigrant protagonists is not always made apparent, yet these new stories of immigration and labor reject conscription into the older conventional narrative that usually situates the decision to immigrate within the ideology of progress that envisions the United States as the land of opportunity. Oppositional narratives show that the motives behind the decision to immigrate are economic and political factors that exist within the present phase of late capitalism. In the process, they make visible the connection between the United States and an immigrant’s country of origin, which is absent in the conventional narrative. The phase of expectations no longer exists in its previous form; instead, the impetus for immigration becomes a quest for survival and not the pursuit of an ideological “promised land.” Now people emigrate because they have no choice—they are pushed out. Many have been the victims of new enclosures created by the global restructuring of resources and industries. Some leave their homes as a result of natural disasters, while others are forced to flee the violence of wars and armed conflicts. The United States’ reliance on cheap labor provides immigrants with the possibilities of work and economic survival. However, while many hope for better lives here, there is no longer a universal expectation of immigrating and achieving the American Dream. Within the new global network of immigration, the immigrant subject is much more aware of the economic realities of living in the United States and is no longer naïve like Enrique and Rosa Xuncax of El Norte , who believed that American streets are paved with gold. Immigrants have emigrated and returned, corresponded with those left behind, and exported cultural productions, actions that have altered the ways in which the immigrant subject sees the United States. Because of the mass movement of people and the immense sharing of information, today’s immigrants enter the country with a more realistic understanding of the challenges they will face as workers in this country. Another characteristic of oppositional immigrant narratives that illustrates the changing composition of immigration in the contemporary moment is the emphasis on what I refer to as the navigation of spatial liminality during the movement from citizen of one nation to immigrant in another. As border crossers, to use Gloria Anzaldúa’s concept, immigrants must constantly make their way through a space that exists in the margins, belonging neither here nor there. Their arrival in the United States does not presuppose an instant incorporation into the nation, so immigrants must learn to traverse the margins to which working-class immigrants of color are most often banished. In a world where immigration laws no longer effectively function to keep out diasporic peoples, the journey to the host country and the crossing of the constructed borders of the nation become an important aspect of the immigrant paradigm. No longer is it assumed that the immigrant is entering the United States through official channels, or through the previous ports of entrance, like Ellis Island. Now immigrants are entering through official and unofficial channels, facing a new set of challenges and perils. Some texts choose to emphasize the journey that undocumented immigrants are confronted with as they make their way to the border of the United States. Traversing the terrain that lies between the site of departure and the border, the immigrant subject must negotiate the liminal space that denies her an official status and defines her as an object that must be apprehended or kept out. Other texts choose to focus on the difficulties experienced by the immigrant at the point of crossing the border. As a site of state oppression and violence, the border gets represented in Latina narratives as one more aspect of the immigrant experience with which immigrants must contend. In such cultural productions, the centering of undocumented individuals’ stories works to incorporate into the genre of the immigrant narrative individuals who are relegated to the margin. Instead of reducing immigrants to the image of “criminals,” the stories of these individuals humanize them. The alternative stories offer oppositional narratives that challenge the invisibility of diasporic people. In the current age of immigration, the undocumented status of immigrants cannot be reconciled under the old narrative of immigration. Instead, the new immigrant paradigm proposed by a Latina literary genealogy pays close attention to the undocumented worker’s constant state of living in the precarious position of being “unofficial.” Living in fear of detection is an aspect of the immigrant experience that does not exist within the old paradigm’s phase of contact and is an important marker of the changes that have occurred in the process of immigration to the United States. Several texts represent the inhumanity of classifying human beings as “undocumented” and forcing them to exist in a marginal space of constant hiding. Others represent the intensification of exploitation that takes place when a domestic worker is undocumented. While cultural producers sometimes do not clearly identify their immigrant protagonists as documented or undocumented, under the present movement of people across national boundaries, official documentation can no longer be assumed. The conditions of immigration for many people of color do not end at the point of arrival in the United States, but continue to influence the life of the new immigrant subject, an aspect of the experience to which Latina writers pay close attention. In the older model of immigration, the protagonist is often represented arriving in a new world, most often surrounded by a different culture and language. The sense of alienation encountered by the immigrant functions to cement the distinction between old and new world, and plays an important role in helping to linearly develop the narrative of the immigrant as a story of progression. In our current state of globalization and transnational movement of peoples, it is unlikely that an immigrant will be unable to find a community of fellow immigrants. Cities like El Paso, Los Angeles, New York, and Chicago provide immigrants with enclaves where they can make connections and find help in negotiating their way through the U.S. economic and political system. Within the older model of narration, the contact phase often positions the immigrant as the “other,” a process that occurs as soon as the immigrant arrives in the country. In the immigrant communities that now make up a vital part of urban spaces, the new immigrant is no longer the “other” but is instead just “one more.” It is only when the immigrant subject leaves the community of immigrants that she is confronted with being the “other,” but as soon as she returns to her immigrant community, she again belongs. The oppositional narratives represent a fluidity in the position of the immigrant subject that is absent in the former narratives’ conception of the contact phase. Many immigrants are also comfortable in urban spaces, dispelling the myth of the periphery as existing outside the core in a premodern state. The heavy industrialization of Latin America and the Caribbean has facilitated the movement of individuals from rural areas to cities in countries of origin, and from those home cities to cities in host countries like the United States. Alternative immigrant narratives more effectively encompass these changes and represent the conditions of immigrant communities existing in the margins of cities. They are uncovering the creation of community, not for the sake of creating separatist spaces, but in an effort to combat the prejudice and discrimination often faced in the world outside of the immigrant community. Current immigrant stories by Latina cultural producers also illustrate the changes in familial relations that make up part of the immigrant experience. Women—who make up a growing part of the transnational immigrant community—often leave behind children in the care of their home communities. Unlike men, who frequently migrate and leave children behind with mothers, these immigrant women must depend on extended families and community members to help raise their children, further reinforcing the link between host and country of origin. As a result of the mass migration of women, the practice of immigrating for work and sending money home has become a major source of income for countries in the periphery. Barbara Ehrenreich and Arlie Russell Hochschild point out that “the governments of some sending countries actively encourage women to migrate in search of domestic jobs, reasoning that migrant women are more likely than their male counterparts to send their hard-earned wages to their families rather than spending the money on themselves” (7). Not only do these remittances help support the families left behind, but they aid in the overall economy of the home country. While some women return to their countries of origin and others eventually send for their families, many are forced to raise their children from afar. The phase of contact in the traditional narrative cannot adequately encompass the relationships that exist between a female immigrant protagonist and her family under the current conditions of globalization. While nation-states might try to ignore/erase the role that women immigrants now play in national economies, oppositional narratives are centering the contributions these women make to the global economy and positioning their laboring bodies as integral to the functioning of multiple national governments. In the older immigrant story, labor often plays an important role in helping the immigrant protagonist achieve success through hard work and in the process perpetuates the myth of an American meritocracy. Contemporary narratives of labor and immigration instead represent labor and the protagonist’s position as a worker in direct relation to the immigrant condition. The space of labor is now positioned as a microcosm for the exploitation of the worker under a capitalistic system that takes advantage of the undocumented immigrant’s liminal position in the United States. Latina narratives focus attention on how the intersection of the protagonist’s being a woman, a person of color, and an immigrant (often undocumented) influences her experience in the workplace. The conditions of labor represented emphasize the racism and exploitation faced by the immigrant protagonist, and while popular texts attempt to reconcile the abuses of the laborer under the ideology of assimilation and success, most of the oppositional narratives do not offer a clear resolution to the difficulties experienced by workers in the space of labor. Instead of situating labor as a stepping-stone to economic success and as a way of achieving the American Dream, the contemporary narrative represents the laboring space as the place where ideologies of race, class, and gender get played out. In the case of domestic work, the insular walls of the home as laboring space help to contain not only the exploitation of the worker but also the physical and emotional violence to which many domestic laborers are subjected. Even though many of the contemporary narratives being discussed in the subsequent chapters follow a linear structure in narrating the story of the immigrant worker that culminates in the resolving of various conflicts at the end of the text, they do not always offer a simple resolution. Some of the texts attempt to provide a happy ending by portraying a certain level of assimilation or, more accurately, acculturation; others challenge the audience at the closing of the narrative by instead gesturing toward the protagonist’s continual negotiation of the immigrant condition. Instead of the easy solutions advanced by the conventional narrative of immigration and assimilation, oppositional immigrant narratives point to a continual experience of immigration under a structure of late capitalism that often begins anew with the constant movement of the individual. The new immigrant subject does not always come to the United States with the idea of settling down forever, and some choose to return home after the conditions of the original immigration change or after earning enough money to return. Some return home disillusioned by their inability to negotiate a racist system based on exploitation. Others, however, are forcibly ejected from the nation through the process of deportation. At the point of deportation, the movement of the individual might be southward, but there is always the possibility of a new journey to the north, gesturing to the continuous cycle of immigration. In what follows, I contend that texts by certain Latina cultural producers are providing a specifically Latina genealogy of new immigrant narratives that more closely engage the conditions of immigration occurring in late capitalism. I position these texts as challenges to stereotypical representations of immigrant workers promoted by popular cultural productions, like Hollywood-produced films. I argue that major Hollywood film producers redeploy the discourse of the old narrative of immigration in an attempt to advance the ideology of the nation as the land of opportunity. In these popular cultural productions, it is imperative that the challenges faced by the immigrant be simply resolved. The realities of exploitative labor cannot so easily be subsumed into the narrative, so those difficulties must be dealt with in a way that makes them simple and unproblematic. By providing the protagonists of the films with problems and conflicts they can fix, the cultural productions can justify happy endings for audiences. In giving audiences the requisite happily-ever-after conclusion, current Hollywood films perpetuate the dominant immigrant narrative and head off any discomfort that audiences might feel about immigrant workers, effectively acting as an ideological form of containment to ensure that the myth of the “city on a hill” remains intact. Each of the cultural productions that I situate as counternarrative to conventional Hollywood movies emphasizes different aspects of the new immigrant narrative being proposed. By mapping out how each cultural production situates the immigrant experience, we can examine how Latina cultural producers are representing the local, marginalized narrative of those who remain relegated to the periphery. The oppositional possibilities of the texts become evident. The work of these cultural producers builds on the project of theorizing the border undertaken by Anzaldúa in the 1980s. The understanding of the border as constructed, as “una herida abierta” (an open wound), and the acknowledgment of the processes of immigration as complex and continuous, expands the project of theorizing the border beyond the physical demarcation between nations (Anzaldúa 25). The specific crafting of narratives around the lives of women draws our attention to the marginalized stories of female immigrants and the particular role gender plays in the movement of individuals across national boundaries. The narratives of opposition included in my analysis incorporate the stories of women, labor, and movement that social scientists have been studying for some time now. To understand the legacy of the traditional immigrant narrative and uncover the ideological work being performed by the schema, I start in chapter 1 by comparing three very different texts that provide conventional stories of immigration. I begin with an analysis of a canonical Chicano text, José Antonio Villarreal’s Pocho , positioning it as an example of the traditional immigrant narrative and reading it alongside the 2004 Hollywood-produced film Spanglish , directed by James L. Brooks. By analyzing the texts together, I look at how the conventional immigrant narrative has been employed by earlier texts and how later films continue the tradition of casting the immigrant story as a narrative of progress and upward mobility. This chapter also illustrates the role that gender plays in constructing immigrant bodies in representation. In my second chapter, I examine representations of immigrant workers in the space of the home. I argue that the representations of these workers in texts by Latina writers reject the message of success present in the Hollywood films. The texts analyzed in the first chapter perpetuate the ideology of the immigrant narrative as a narrative of progress, while texts by Latina writers challenge stereotypes about domestic workers through an inclusion of stories told from the perspective of marginalized voices and promote a new literary genealogy. The film Spanglish stands in stark contrast to the representations of domestic labor and gendered immigrant bodies advanced by Lucha Corpi’s novel Cactus Blood , Anayansi Prado’s documentary film Maid in America , and the plays Latina , by Milcha Sánchez-Scott, and Living Out , by Lisa Loomer. Chapter 3 shifts the discussion of immigrant domestic labor to the public space of the hospitality industry. I juxtapose three Hollywood movies—Wayne Wang’s Maid in Manhattan, Wes Anderson’s Bottle Rocket , and Ken Loach’s Bread and Roses —with Esmeralda Santiago’s novel América’s Dream and Marisela Norte’s spoken-word piece “Act of the Faithless” to analyze the various representations of domestic labor that take place in the transnational space of global cities. In this chapter, I expand the conversation on domestic labor to include janitorial work and housekeeping in the sphere of the hotel industry and office buildings. Loach’s film provides an opportunity to discuss the multiple forms of resistance taking place through the unionization of immigrant workers in the public realm of domestic labor. The final chapter analyzes the strategic move of positioning immigrant workers as Superheroes and the role that new technology plays in creating new Latina narratives of immigration. By looking at the Superheroes photo series by Dulce Pinzón alongside Laura Alvarez’ multimedia series Double Agent Sirvienta and Anayansi Prado’s Maid in America , we can investigate the role that resistance to invisibility plays in several examples of visual culture. The move to position workers often marginalized and made invisible by their labor and immigration status as heroic and bigger than life rejects the common rhetoric that represents laboring immigrant bodies as a waste or a drain on our national resources. These cultural producers offer new and exciting representations of immigrant narratives that expand the parameters of the genre. While I have organized my chapters according to the different conditions I have identified in my argument, I have done so for the sake of creating a sense of coherence. I do not mean to imply that the current conditions of immigration occur in a linear/temporal fashion or to re-create a linear schema of narration. Trying to identify one unified organizing schema would re-create the disciplining of knowledge that the project of genealogy is trying to challenge. I also am not arguing that the literature, film, and other media that I analyze in this book exist completely outside of dominant ideologies, but the texts do provide more complex representations of contemporary immigration and labor. Instead of claiming that the counternarratives that I discuss are somehow more “authentic” or “real,” I want to read these works as offering a different perspective or representation of what has become a popular literary convention. I hope that by reading literature by writers of color through the lens of a new immigrant paradigm, I can contribute to a growing dialogue on what it means for individuals to live under the current global conditions of immigration and the role that cultural productions play in challenging or perpetuating anachronistic models of movement through national boundaries. As a whole, the texts offer a Latina canon of oppositional narratives that challenge the ideological construction of the nation while expanding the theorization of the border. Through their insertion of narratives of oppression, injustice, and hardship—subjugated knowledges—Latina artists/authors are creating a powerful cultural legacy of resistance.